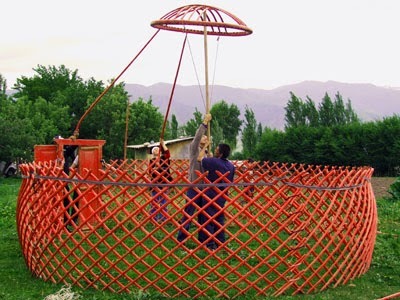 In this article Lilya provides an overview of the yurt and how it is used in Kyrgyzstan today. Part #2 will describe Kyrgyz yurt traditions today plus how to assemble a yurt. One of the greatest and most wonderful inventions of humanity, the yurt is the main type of dwelling of Central Asian nomads. According to archeological accounts, the first yurt prototype appeared more than three thousand years ago. This dwelling made it possible to lead a nomadic way of life, roam around the immense territories and reclaim new lands. During the summer, cattle graze on the lush jailoo (alpine pastures) of the Tien-Shan mountains. Before the winter season starts, the herds of cattle are moved back to the lowlands where snow cover is quite thin and cattle graze. A yurt is indispensable to sustain this seasonal routine. 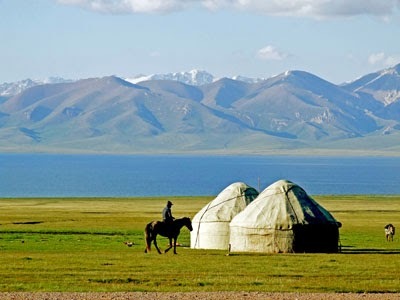 In Kyrgyzstan, a yurt is known as a boz ui (grey house). In earlier times there were others: ordo (khan's yurt) and ak orgo (luxurious white yurts). Yurts used as homes are the most widespread. The second type is a ceremonial yurt, for parties. These yurts are usually quite large with gorgeous ornamentation. “Khan’s yurts” can be more than 20 meters in diameter. For example, a large mobile yurt of the early 20th century Mongolian Bogdo-khan had a capacity of 500 people. Camp (marching) yurts were small enough and were carried by one camel or even a horse. The Mongols transported yurts on carts: mobile dwellings for nomadic trips and military marches. The size of a yurt depends on its function. 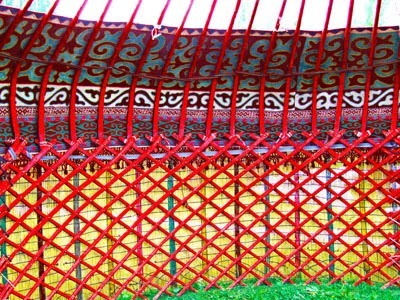 For instance, an ordinary nomad's yurt consists of three or four trellis wall parts, therefore its dwelling capacity is equal to eight to ten people. An enormous yurt-palace of a khan could be based on ten, twenty and even more trellis wall components with capacity that could vary from 50 to 100 people. The approximate weight of a nomad's yurt, with its furnishings, is 200-300 kilograms, which is the carrying capacity of one camel. The yurt's average diameter is 4 – 6 meters and its assembly takes 2 – 2 1/2 hours. Dismantling is around 1 hour. Mongolian yurts have a cone-shaped roof, whereas the Turkic type can have a semi-spherical housetop. 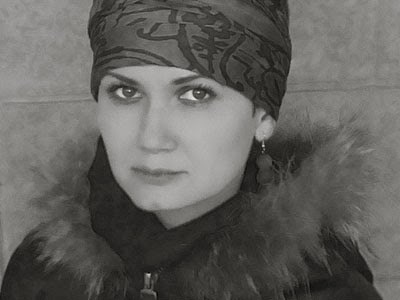 Traditionally, the Turkmen use the Turkic type of yurt; the Kyrgyz, Kazakhs, Uzbeks, Kara-Kalpaks and Bashkir have both types – Mongolian and Turkic yurts. The manufacturing and assembling of the Mongolian yurt is less complicated than the Turkic variety. However, because it has quite low walls it does not withstand snow loads as well as the Turkic yurt, which is lighter, but more solid. Yurts respond with extraordinary subtlety to temperature fluctuations: in summer it protects from intense heat (at times 40C - 45 C +) and in winter from extreme cold (minus 30 and even lower). On the steppe, winds and windstorms prevail. The yurt is made of trellis panels and felt, which has an air-entrapping structure, that regulates the inside temperature. It is possible to create circular airing by ensuring the felt at the yurt's foundation be raised slightly. Note that high-quality yurt felt withstands three days of pouring rain; after that dampness starts penetrating inside. the internal space can be varied by means of adding or removing trellis wall sections, etc. The second part of this article will focus on Kyrgyz yurt makers today. Certainly on an Uzbek Journeys tour to Kyrgyzstan you have the chance to visit yurt makers and opportunities to dine in yurts.